One of the many ways I reconciled myself to the idea of not majoring in English in college was my knowledge, even then, that I am perfectly terrible at completing required reading. A significant number of works considered classic I find myself unable to read, including (a moment of truth!) Dickens. How it came about, then, that I forced myself through all those accounting textbooks and read practically every single page of each assigned chapter remains a mystery to me. I think what’s always hung me up about Dickens, and, frankly, George Eliot, is the sheer quantity of characters and tangential plotlines. I am a person who reads for character in that I like getting to know characters – but I want to relate to them in some way, to champion their causes, and to feel their joys and sorrows; at the very least I want to sympathize with them, even if I can’t fully relate. But particularly with Dickens, and to a certain extent with Eliot, there are so many characters, and sometimes so much time is spent on characters about whom I care less than little, that it makes for very hard going. My attention wanders. I stagger the truly dull points with other material: froth fiction, or magazines, or books where things happen (much more quickly), or books I know I’ll enjoy because I’ve read them before. The first Valentine I received this year was from Anthropologie, encouraging me to treat myself for the holiday. It included the graphic off to the left. 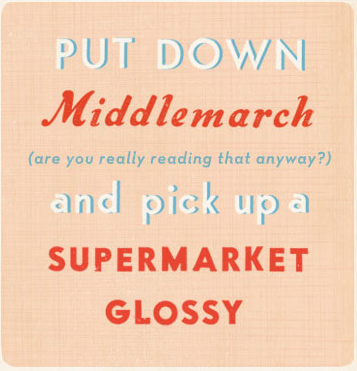 I had a brief moment of panic where I thought about privacy on the internet: had Anthropologie gotten access to my GoodReads account, and seen the amount of time Middlemarch has been “in progress”? What information about us do the search engines we prefer really capture? What are the implications for me as a person and society as a whole? Reason returned when I realized, beyond the extreme unlikelihood that they would customize an ad for each customer, that if they had, they probably would have chosen Jonathan Strange & Mr. Norrell, as it’s been “in progress” for (probably much more than) twice as long – yet I’m significantly more certain I’ll enjoy Jonathan Strange & Mr. Norrell, if I could only just devote a lot more time to it. But perhaps you have had the same question, reading this blog. Is she really reading Middlemarch? Yes. She is. Just very slowly. The speed of my progress is defeated by the depth of character details without any way to easily classify these characters as “good” or “bad”. (This is clearly not what impedes me with Dickens, as good-bad classification there is generally easy; it’s solely the quantity of tangents and characters that waylays me.) It may be a gaping weakness in my character and reading habits that I search for the characters I like best in stories. And where I’m struggling in Middlemarch is that there isn’t anyone I really like, except (so far) the Vicar, Camden Farebrother. But he’s only recently come on the scene, so it’s really too early to say. Or maybe I just subconsciously wanted to go through an entire year of holidays with Middlemarch. This entry was posted in Books, Reviews, and Reading and tagged books, Middlemarch, reading on February 15, 2012 by ms.grammarian. Haha! It is a arduous read, that’s for sure. I dealt with it by getting it over with… but it’s true, there weren’t a lot of characters that were easy to relate to. I got frustrated with so many of the women and a few men for not standing up for themselves, for taking the poo that was thrown in their direction by others, etc. Looking at that, it was to me at the same time a vivid description of how females were treated back then, and what they did to overcome it or simply work around it. I don’t think I’d have made a very good 1700’s-1800’s female. :-) Good luck with it!